Definitions: First, we need to familiarize all the terms before moving to performing the lab. Active Directory Forest Discovery: discovers AD Sites and Subnets. 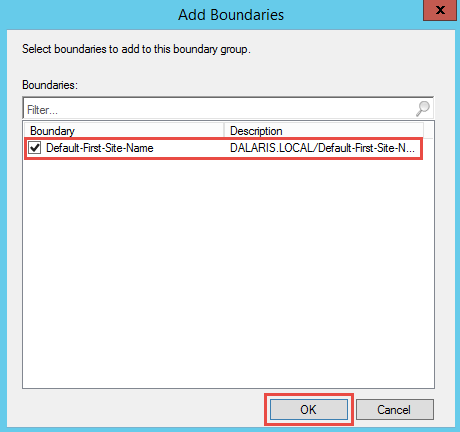 For each discovered site and subnet, Configuration Manager can create a boundary for it. 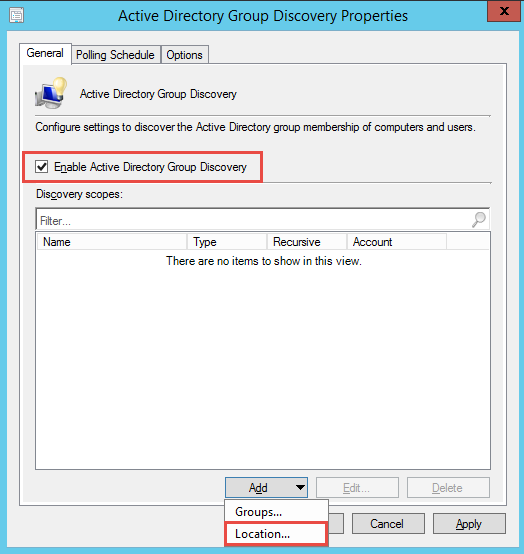 Active Directory Group Discovery: discovers local, global, and universal security groups, their memberships within those groups, and membership within distribution groups from a specified Active Directory Domain Services. Distribution Groups are not discovered as group resources. 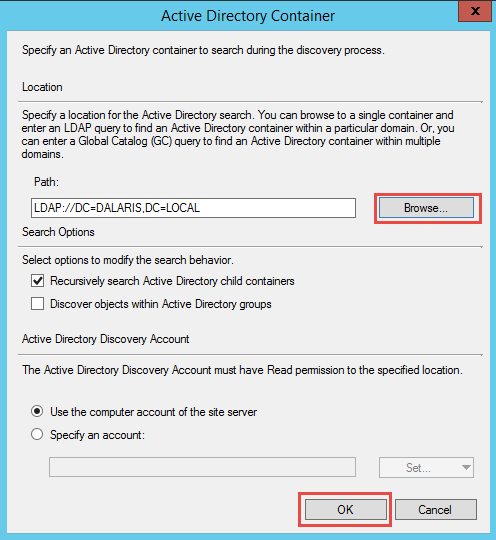 Active Directory System Discovery: discovers computer systems within a specified location within Active Directory Domain Services. 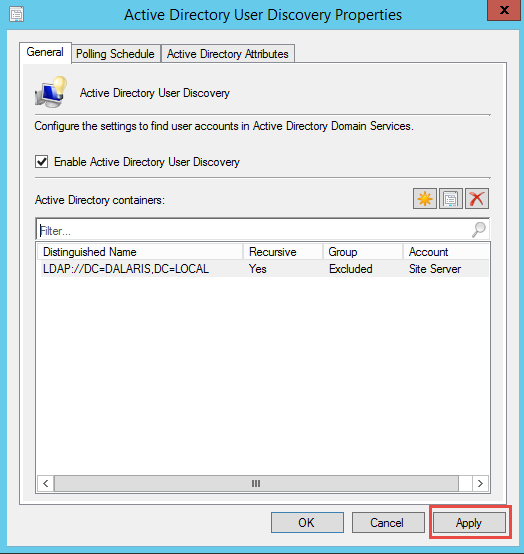 Active Directory User Discovery: discovers user accounts from the specified location within Active Directory Domain Services. To see all six discovery types, launch Configuration Manager, click Administration -> Hierarchy Configuration -> Discovery Methods. Boundary is a network location on the intranet that contains one or more IP devices to be managed. Boundaries can be an IP subnet, Active Directory site name, IPv6 prefix, or an IP range. The hierarchy tree can include any of the above combination. In order to use boundaries, we must add boundaries to boundary groups. These boundary groups are collections of boundaries. 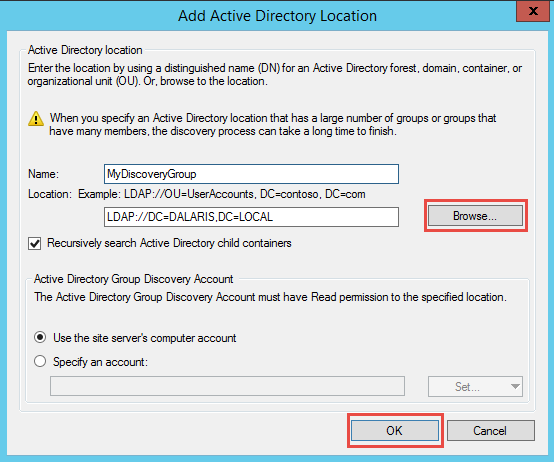 Double-click on Active Directory Forest Discovery. Checkmark on the indicated boxes to enable AD Forest Discovery. You will be prompted to run full discovery as soon as possible. Click Yes. 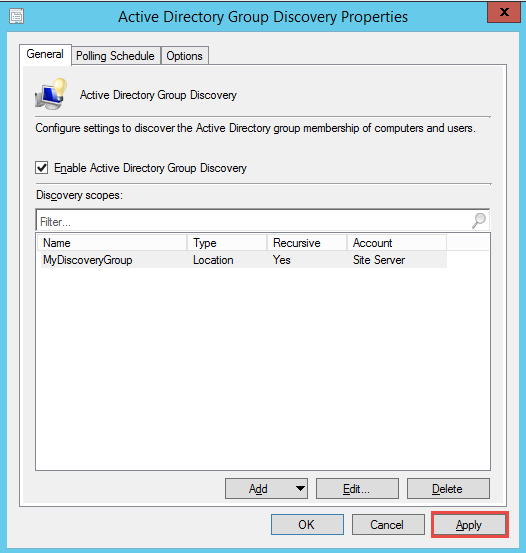 Double-click on Active Directory Group Discovery and checkbox on “Enable Active Directory Group Discovery“. After that, click the Add drop down list and choose a location. Browse to the Dalaris.local domain. Click Apply and run the discovery when prompted. Click OK when done. In order to push SCCM clients into the computers we must first discover the computers. 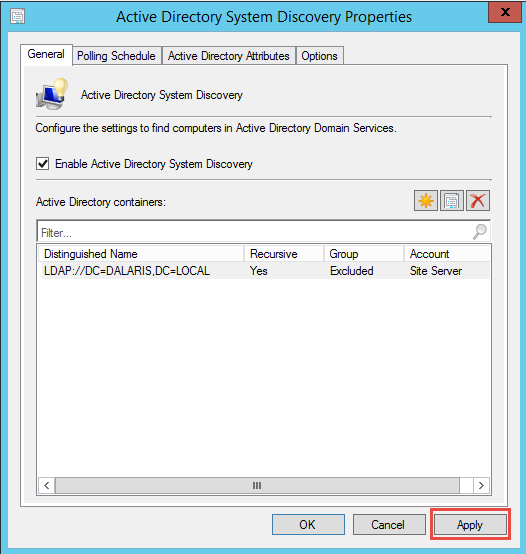 Double-click on Active Directory System Discovery. 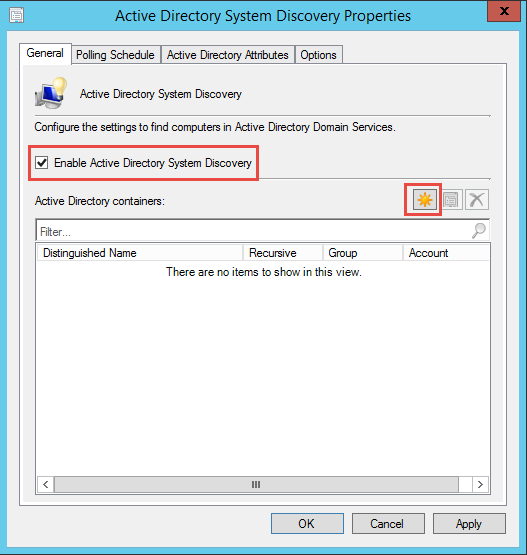 Checkmark on “Enable Active Directory System Discovery” then click the yellow icon. Click Browse, choose the domain, and click OK when done. Click Apply to run full discovery. Click OK when finished. 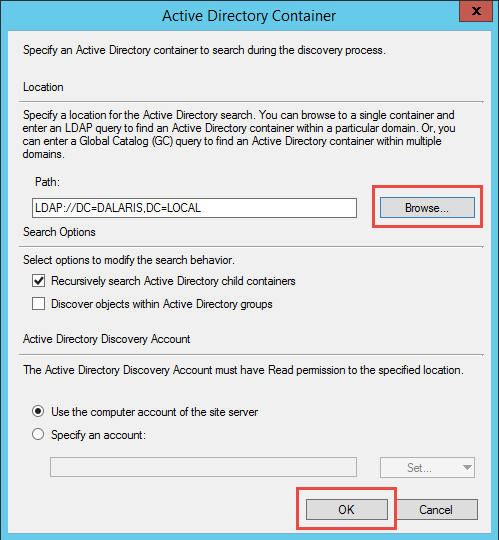 Double-click Active Directory User Discovery. 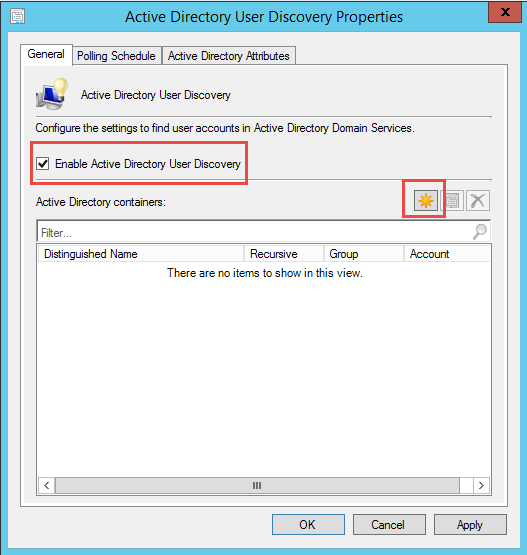 Checkmark on “Enable Active Directory User Discovery” then click the yellow icon. Browse to the Domain. Click OK when done. Click Apply and run the discovery. Click OK when done. 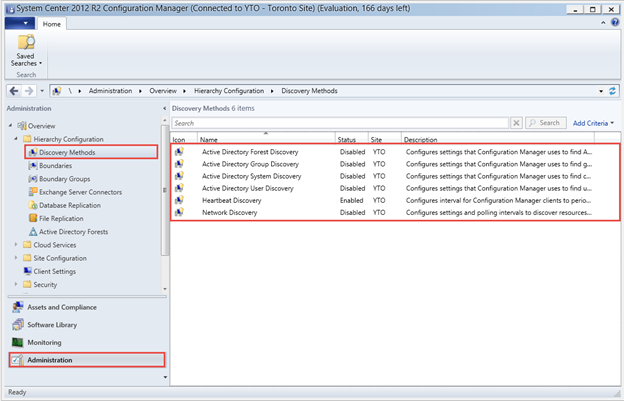 Heartbeat Discovery runs on all Configuration Managers client and is used by Active Configuration Manager client to update the discovery records in the Configuration Manager database. The DDR is sent to the management point in a specified period of time. Heartbeat is enabled by default and there is no need to enable it. Network discovery search the entire infrastructure for network IP devices. It can search domains, SNMP-enabled devices, as well as DHCP servers to discover resources. It also discovers printers, routers, and bridges. 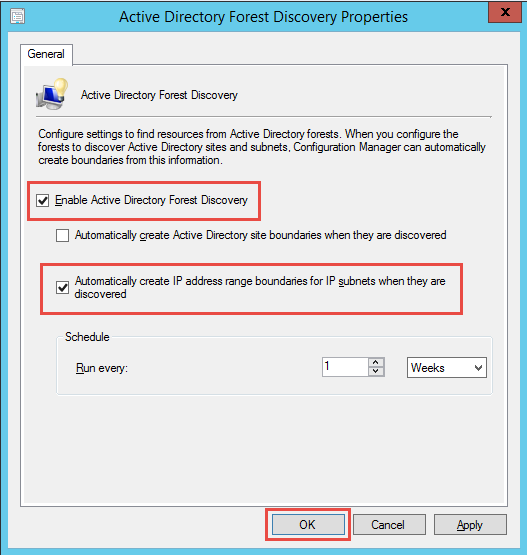 When we enable Active Directory Forest Discovery, Boundaries are discovered automatically. 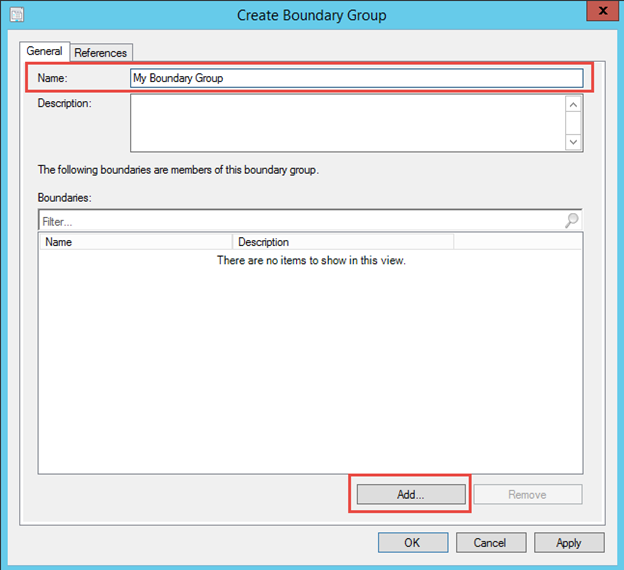 We will now add the found boundaries into a boundary group. But first, let’s create a boundary group (BG). 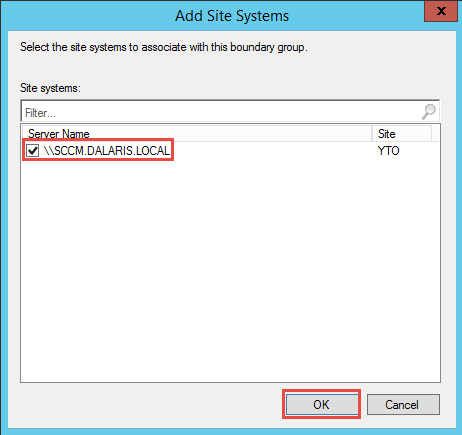 In Configuration Manager Console, select BG and right click an empty area to create a new BG. Name the group and click Add… to add the boundary to the BG. Put a checkmark on the discovered site and click OK.
Click References, Use this BG for site assignment. Click Add to add Site System Server.